1 – An afternoon workshop entitled CLIL Projects led by Alessandro Agnetta, Liceo Statale ‘G.A. De Cosmi’, Palermo, 17th October, 2014. 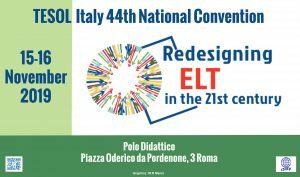 1 – A TESOL DAY entitled The Teaching of Literature with Eleonora Chiavetta, Enrico Grazzi and Stefano Mochi. View announcement here.